I had a client who wanted use WooCommerce to sell tickets to seminars she teaches. No problem. WooCommerce can easily handle that. But she also needed to send a custom email for each seminar with time, location, and links to pdf documents. The Follow Ups plugin by WooCommerce is perfect for creating WooCommerce Custom Product Emails, plus much more. The following tutorial explains how to create WooCommerce Custom Product Emails. Note: This tutorial requires that you have WooCommerce and the WooCommerce Follow Ups plugin installed. Download and install WooCommerce Follow Ups plugin. The plugin is $99, but well worth it. Very easy to use and lots of follow up customer email options. How to Install WordPress Plugins. Go to Follow Up Emails and click the Create New Follow-Up button. The Edit Follow-up screen is displayed. Enter a Follow Up name and email subject line. Enter the Follow Up email text. From the Follow-up Type list, select Storewide Email. From the Template list, select WooCommerce. In the Sending Delay field, enter 1 minute. From the Trigger list, select after Order Status: completed. 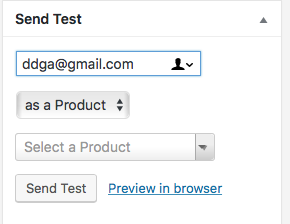 In the Product field, search for the product to which you want to send this custom email. Check the Always Send option. Checking this option means Follow Up emails are sent whenever a customer buys the product. Click Save Email to save the follow up email. If you want, you can send a test email. Enter your email and select as a product. Click Send Test to send the follow up email to the specified email address. Or, click Preview in browser to preview the follow up email in your browser.